The Vulnerability Landscape of Greece Report is a technical report compiled by ADACOM Cyber Security, which includes the major problems of Greek organizations. The current report contains a statistical analysis of the security findings discovered by ADACOM during a period of three years and a sample of 200 security engagements of various types. The findings represent actual vulnerabilities discovered and/or exploited in a number of systems hosted/managed by organizations mainly established in Greece. Our objective is to report on these findings with a contextual approach and provide an expert analysis on their source, as well as advise on their remediation. Social Engineering Assessment (SEA): assessing the human element with regards to cyber security. 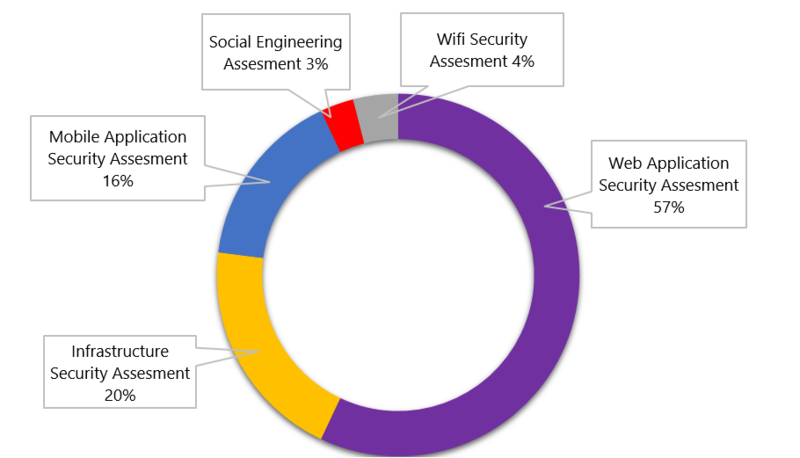 The following pie chart presents the percentage of the engagement types during the abovementioned time period. Typically, 15% of the organization users freely give their credentials during a social engineering attack.